Hi guys! 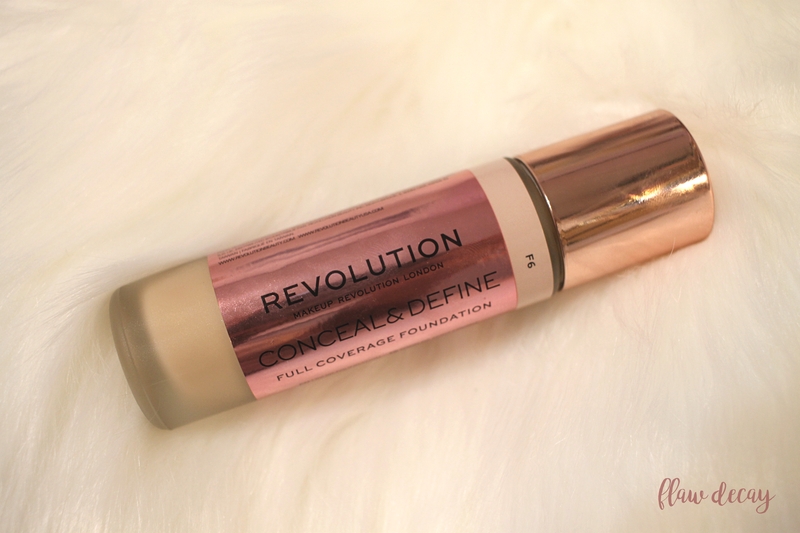 Today I’m going to be talking about a very recent purchase of mine: the Conceal & Define Foundation from Makeup Revolution. I’m going to tell you a little bit about the product according to the brand, as well as the pros and cons, a 9-hour wear test, and my final thoughts. In Beauty Bay‘s website, this foundation is described as “full coverage” and is said to be “available in a range of universally flattering tones“, with 24 shades available. 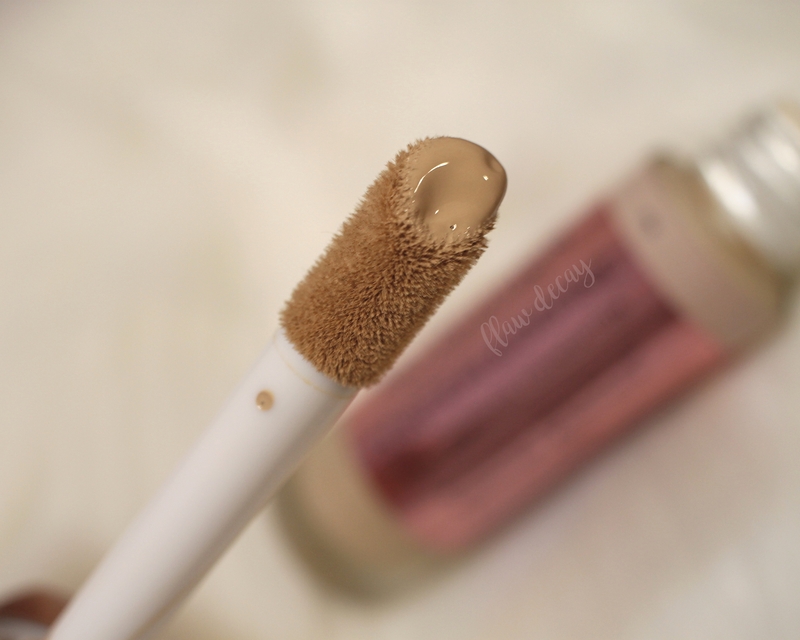 It’s supposed to offer a “lightweight yet buildable coverage“, and it’s highlighted that the formula is oil-free, creamy, and creates an even and airbrushed complexion. It “dries down to a demi-matte finish without settling into fine lines” as well. As you’ll probably recognize from the second photo, this foundation mimics Tarte‘s iconic Shape Tape doe-foot applicator that everyone loves, which was already present in their Conceal & Define concealer, which I’ve also reviewed. I picked up the shade C6 (for light-medium skin tones with a neutral undertone), which matched my skin very well. I feel like the shade range is nice for a drugstore foundation! But on to the most important part: how does it perform? The foundation is very matte, but not too much. I have combination skin and foundations either look too oily or too dry on me. This foundation didn’t give me any of that and the greasiness was barely noticeable on the skin after 8+ hours. The coverage is really great; you definitely get full coverage from the very first layer. It’s buildable. In the photos from the wear test, I only used a light coat because I didn’t need more coverage, but I did apply a little more on my chin as I had huge breakouts and I needed that extra coverage. It didn’t look unnatural and the foundation covered them nicely. It’s surprisingly lightweight. It doesn’t feel or look cakey at all. The applicator makes it easy and fast to use. Pairs well with both silicone and water-based primers, which can be useful for people with oily and dry skin. They say it doesn’t, but it sits on fine lines pretty soon. It looks amazing just after applying it, but it enhances them too much after a while. Definitely not suitable for mature/wrinkled skin. I did use this hydrating primer with it once and it made mine less pronounced, but it’s something to take into account for dehydrated skin regardless. I got the feeling that my pores got a bit clogged when using it, even if it didn’t feel heavy. It also heavily dried up one of my pimples. The foundation lasted pretty well on my skin. It didn’t get too oily despite me going around all day and walking home for about 20 minutes just before taking the last photo, which is amazing! I’ve been trying it for almost a week and I got the same results every day. Note: it looks like it faded a little on my chin after 9 hours, but it’s lipstick. The most significant problem I’ve gotten with this foundation was fine lines on the corner of my lips. The foundation definitely settles on wrinkles way too soon, but I get that all the time with pretty much all foundations and I’m used to having to check up from time to time. This foundation enhanced the fine lines and tiny pimples of my forehead, but I don’t find it serious since you have to look very closely to notice, in my opinion. If I had to simplify my feelings for this foundation in a “yay” or “nay”, I’d definitely say it’s a “yay”! The foundation looks amazing on the skin and it’s perfect for photos. I love how it’s very comfortable to wear, and how fast it can be applied. I’m still trying to find ways to stop it from cracking on my fine lines -and moisturizer has done a pretty decent job-, but then again, that happens to me with every foundation. For me, it’s as easy as checking in the mirror every now and then and touching up a little with a sponge or your fingers. I’ve had a hard time with matte foundations lately (NYX‘s latest Can’t Stop Won’t Stop Foundation separated a lot on my skin and Colourpop‘s No Filter one was a little too oily for me), but this one is very affordable and worked perfectly for me. I’m glad to hear you liked this foundation, I will definitely try it out at some point. I really liked the concealer under this name.